After a second trip to the AFC Championship game in as many years, the New York Jets have begun the process of restocking the roster in an effort to help head coach Rex Ryan keep his Super Bowl promise. The team released four players Monday: offensive lineman Damien Woody, nose tackle Kris Jenkins, linebacker Jason Taylor and defensive end Vernon Gholston. All the moves were expected. Woody and Jenkins have 23 years of NFL experience between them and both have been plagued by injuries recently; Jason Taylor, 37, is expected to retire; and Gholston, the Jets sixth-overall pick in the 2008 draft, never saw his on-field production approach expectations. In three seasons, Gholston started just five games, managed 42 tackles and never once registered a sack. He earned $21 million in guaranteed money on his rookie contract. "I kind of had an inkling [I could be released]," Woody told ESPNNewYork.com. "I'm no fool. As you get older, you understand the business side. I understand my salary-cap situation, age and injury. I don't have any complaints. My time here was priceless. I was part of something special." 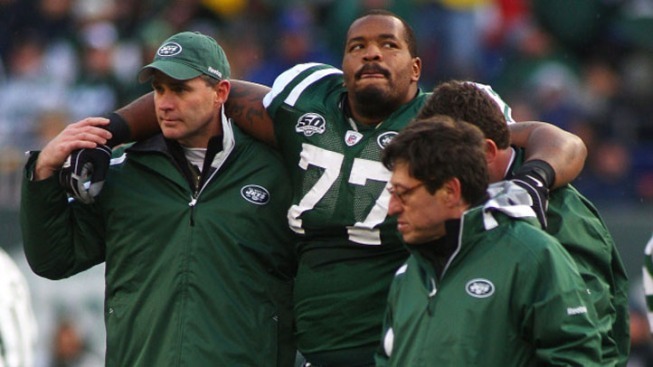 Jenkins echoed similar sentiments but said that there's a chance he returns to the Jets. "They didn't give me anything etched in stone, but that's not even my first concern," Jenkins said. "My first concern is doing my rehab and getting healthy." The moves save the Jets more than $13 million in 2011 salaries, and that will make it easier to re-sign the unrestricted free agents considered integral to New York's championship hopes. Wide receivers Santonio Holmes and Braylon Edwards, and cornerback Antonio Cromartie -- in that order -- are at the top of general manager Mike Tannenbaum's to-do list. For now, though, the league has bigger issues than impending free agency and the upcoming draft. There is still the matter of labor uncertainty. If the owners and the players don't reach a deal by March 4, there could be a lockout. And worst-case scenario: no football in 2011.